I read a statistic the other day that made me so, so sad. By 2050, there will be more plastic bottles in the ocean than fish. The more I travel, the more conscious I become of the impact that I’m having on the places I visit. On my most recent trip through South East Asia, I threw away hundreds of plastic bottles and plastic bags from shops that I carted around until I could find what seemed like a suitable place to dispose of them. I swam in oceans surrounded by garbage because in many places there simply is no such thing as waste management. I saw first hand what tourism is doing to impact the environment and I felt so embarrassed, so angry with myself for not doing my part to reduce it. So I decided to change that. I decided to do some research and invest in products that would make me a better, greener traveler. These are all products that I have tested and love. They are environmentally conscious, they reduce the amount of waste not only while you’re traveling, but while you’re home, too. It might not seem like you alone can make a difference, but imagine if we all made small changes to reduce the waste in the world? You should definitely consider traveling with a water bottle, no matter what type. Constantly buying plastic bottles is wasteful and obviously contributes to the demand as well. My favorite is the LifeStraw Go. 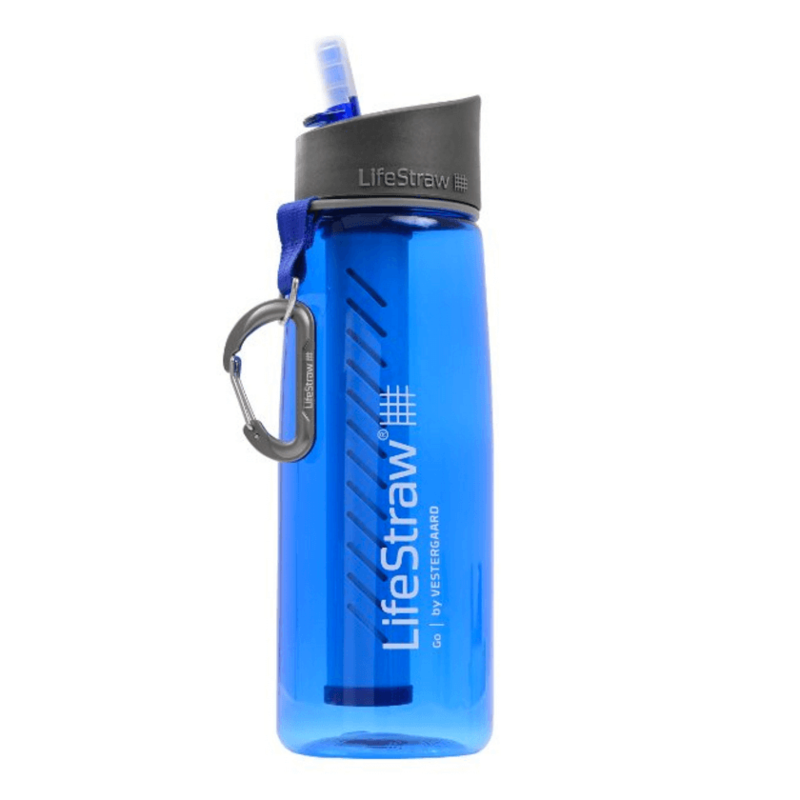 There are a few different varieties of Lifestraw bottles, but the LifeStraw Go is perfect for what I need. It has a built-in filter that cleans the water as you drink it through the straw. It eliminates 99.9999% of waterborne bacteria and 99.9% of waterborne protozoan parasites which makes basically any type of water you find along your travels, safe to drink. Each filter lasts for 1,000 liters which is an absurd amount of water. On a really thirst day I drink about 3 liters. That’s almost a year of water (333 days). You can buy filter refills, it’s BPA free, and for every bottle that you buy a child in a developing country gets clean drinking water for an entire school year. SipWell Stainless Steel Drinking Straws are a great investment for those that love themselves a morning smoothie. I thought some people might think it was rude if I started bringing my own cup to the smoothie stands each morning, but actually people are very receptive and are more than happy to use your cup to make a smoothie in. You get a pack of four for less than $7 and you can use them whether traveling or at home. I was slow to the Diva Cup party, but it was one of the best things I bought for my travels. I can’t imagine how many tampons I would have had to pack for five months (because there definitely aren’t any to be found in rural Laos). It also means nothing to dispose of along the way. It’s super easy to use and so tiny it hardly takes up any space in my bag. I love these. Did you know that plastic utensils aren’t biodegradable? These To-Go Ware RePEaT Reusable Utensils are made of bamboo, they’re easy to clean, and they come in a carry case that’s made of recycled plastic. You get a fork, knife, spoon, and chopsticks and you never have to throw away plastic utensils ever again. These are a great way to charge on the go AND use less energy from the grid. Solio Bolt Battery Pack + Solar Charger is the one I’ve been using recently. It was really reasonably priced compared to others and it is super light and small – so easy to pack in my carry-on. It’s best for charging things like a Kindle or phone. It gives it a good boost while you’re on the road and nowhere near a power source. I use these types of bags all.the.time. I use them when I go to the grocery store, when I go on a road trip, or when I’m on the road as an extra tote bag. It’s amazing how many chances I find to use these bags. Buying some souvenirs, waters at the convenience store, snacks at a market – skip the plastic bag that will probably end up on the roadside and use a reusable tote. This pack of FINEX Reusable Shopping Totes comes with five that roll up into themselves so they take up no space at all. Even better, head to your local grocery store and pick up some of those 99¢ reusable bags and roll them up into your luggage before leaving home. Did you know that there’s a chemical in many sunscreens that is killing coral? I didn’t either. As a newly certified diver I feel like I owe it to the underwater world to keep my skin free of things that are ruining the very beauty I’m going down there to see. The chemical that seems to be the biggest trouble maker is called oxybenzone. Turns out it’s not so good for us either! Try looking for sunscreens that have mineral blockers like zinc-oxide instead. Badger Sport and SPF Rx are good ones that I’ve tried in the past. I know this all seems like a lot, like everything that we do has possible repercussions. It’s not meant to scare you or guilt you into buying expensive products, but it’s something I feel passionately about and I think if more people realized what simple changes we could all make, we could do a bit better for this planet. Even if you choose to change just one of your habits while traveling it can make a huge difference in the long run.